Public comment is sought on PedPDX, which is scheduled to go to the City Council this spring. Walking would be prioritized over other forms of transportation under a plan being submitted to the City Council this spring. PedPDX would affirm walking as a human right and the most fundamental means of transportation. It is being prepared by the Portland Bureau of Transportation, which is seeking public comment on the proposal, which would replace the city's current pedestrian plan, which was last updated in 1998. "An incomplete pedestrian network limits the city's ability to absorb growth and meet the livability needs of residents, including safe walking access to public transit and essential services," reads the executive summary. "We've heard over and over from people that they do not feel safe walking in Portland," said Transportation Commissioner Chloe Eudaly. 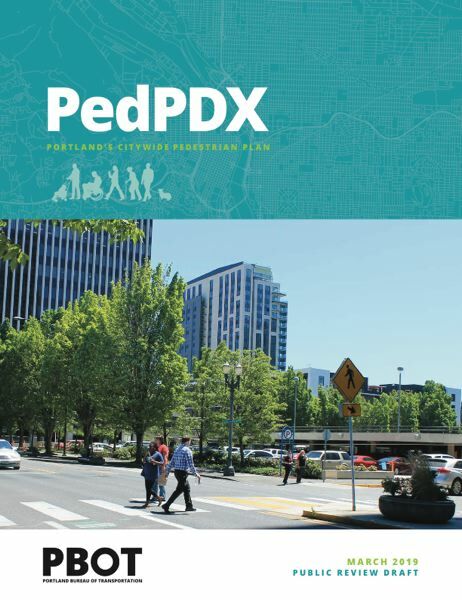 Among other things, PedPDX says the city lacks approximately 350 miles of sidewalks, and need an additional 3,500 crosswalks, including marked crossings within 100 feet of all transit stops. PBOT has identified a Pedestrian Priority Network, which are the streets and paths that provide important connections for people walking to key transit and land use destinations. "People walking in Portland are ten times more likely than people driving to sustain a serious or fatal injury. As a Vision Zero city, no death on our streets is acceptable. But we have limited resources to address our immense safety needs," said PBOT Interim Director Chris Warner. "This plan provides a data-based approach to pedestrian improvements that will make sure we are focused on the greatest needs first, in an equitable way." • An online open survey with an interactive map. You can find it here. • Seven "View and Review" parties during March and April. They will include a video overview of the plan and a chance for participants to discuss it with bureau staff. The first two parties will be held on March 12 at the Brentwood-Darlington Community Center. Details and additional events can be found here. You can read the proposed plan here.